Sunday night, diner at Zarrob was a real treat! 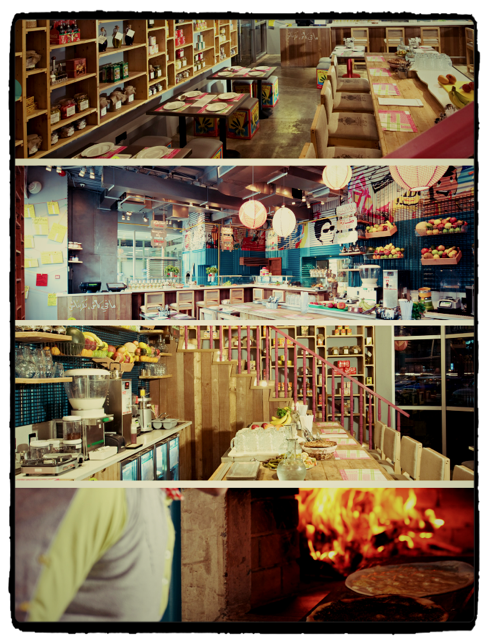 Have you been to this "oh so cool and different" food grub nestled on Sheik Zayed Rd by interchange 1? You won't miss the large green and pink neon lights logo outside. The Koshari stand in front of the restaurant give an idea of the theme: Levant street food. We walked into a busy and eclectic space. The interior is designed around concrete and metallic walls ornamented of graffiti and stencil decor (Smurf / pop icon, Om Kathoum / Arabic icon) mixed with rustic wooden furniture. Cans of Kraft cheese, corned beef, olive oil and Nutella are on display to create a authentic but modern food joint. On the menu a range of classic Arabic family food dishes like Mana'ish, a wood oven baked flat bread which is served open or folded with fillings such as cheese, sumac, zaatar and meat. Don't miss Foul, traditional breakfast dish made of beans, lemon juice, olive oil and garlic but also the Saj bread, falafel, hummus or fried halloumi on a stick. The traditional poor man dish from Egypt called Koshary is a must try at least for the novelty! Imagine, mixing into a single dish, pasta, rice, lentil, chick peas, fried onions and garlic and adding to this chili sauce. The menu is extensive and very reasonably priced. The best way to enjoy all popular dishes from across the Arab World is to order a selection and share. Zaroob is located in Jumeirah Tower, next to Al Attar Business Tower (with HSBC) on Sheikh Zayed Road. Open from 9am to 12 midnight.